November 4, 2015 October 28, 2015 Amanda B. Our bulletin board in the hallway hadn’t been changed in a few weeks and I wanted to put something out there that would give the students a sense of belonging in the classroom. We have had a few issues with students not respecting the toys and materials in our room, and being disrespectful to each other. We are addressing this ongoing issue with a book. One that is probably read in most kindergarten classes (and if it isn’t – then it should be): How Full is Your Bucket?. It is a great way to get children to think about other people’s feelings in a tangible way. Feelings are such an abstract concept, and teaching young children empathy is easier when you can attach an easily understandable concept to it. After reading the book, we made a list of actions that would ‘fill’ someone’s bucket, and a list of things that would ‘dip’ in it. We also have our own bucket in the class that is getting filled with pompoms every time someone is a bucket filler. It is serving as a great reminder to the students, and making them think about their behaviours in new ways. For our bulletin board, I cut out puzzle pieces (I used this template) and had enough for every student in the room to have one (yes, there is missing two puzzle pieces from students that have been absent!). They drew a picture of what they could do to be a bucket filler, and told us what they chose to draw. 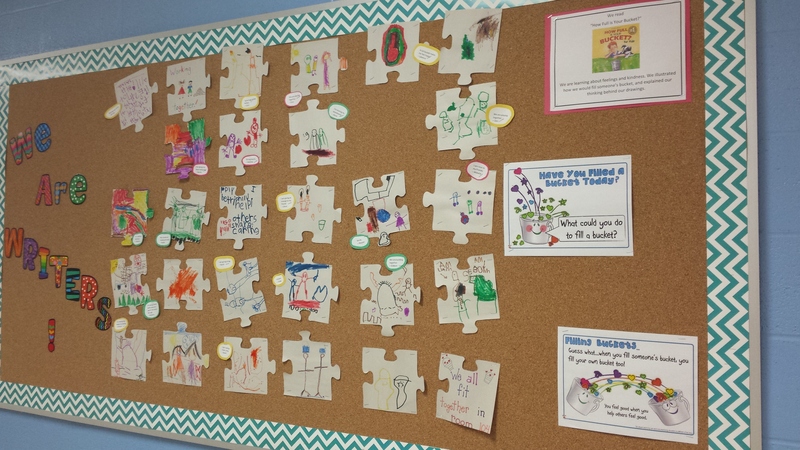 I put the whole puzzle together to show them that when we work together; we can be part of something bigger. I added some posters from Teacher’s Pet Displays so that others walking by would understand what it was about.